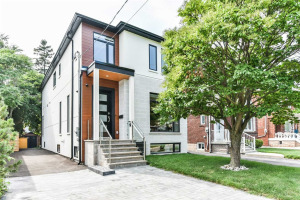 Gorgeous Rebuilt 4 Bedroom Family Home On A Quiet Tree Lined Street In Prestigious Woodbine Gardens. Beautiful Natural Light Bathe The Large Principal Rooms. 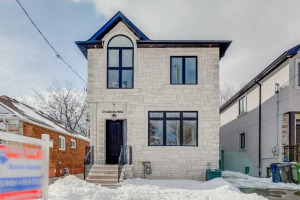 This Home Features Great Flow And Function, Vaulted & Cathedral Ceilings, Hardwood Floors, Lots Of Closets, A 2nd Floor Office For Those Who Work From Home, Garage And Private Drive W/3 Car Parking. 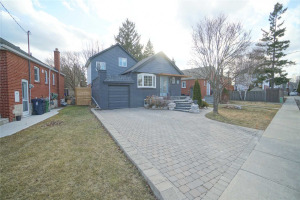 Lovely Renovated, Finished Basement Has A Bedroom, Washroom , Family Room W/ Walk Out To Large Yard . Stainless Steel Fridge, Stove, B/I Dishwasher, Microwave, Washer & Dryer.All Electric Light Fixtures. 2 Fireplaces.Tons Of Built-In Storage Radiant Floor Heating .Furnace & Tankless Water Heater 2019. Ac 2018. Roof 2019 . Freshly Painted .